A new year and a new (well, slightly revised) Cthulhu Breakfast Club! Yoggies gather once again in the cool climes of Yorkshire to talk of things they have seen and heard (and some things, quite frankly, they haven't – but that never stopped them before). The January edition of Breakfast Club features LOUDER hosts, a new melding with the old News from Pnakotus, discussion of Kickstarter conundrums, and printing cthulhiana in 3D. Talking of "3D", this meeting was originally broadcast live in 180º stereoscopic video. Truly, we are living in end future times. We also have a giveaway this month, a stereoscopic viewer to help join along with some of our forthcoming endeavours – details can be found in the CBC forum. 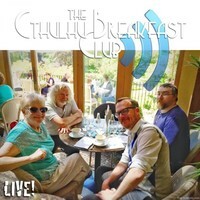 Welcome, once again, to the Cthulhu Breakfast Club! Also thank you to @CatPelgrane who provided copies of Hideous Creatures for us to talk about. The decision not to ship outside the US has lots of folks upset but Fred pointed out (on Twitter) that the last time they did a KS with International shipping the company needed a 6 figures handout to survive the cost issue. Your best bet is to hope a company picks up some after the KS and deals with the shipping etc to get them to the EU/OZ/RoW.